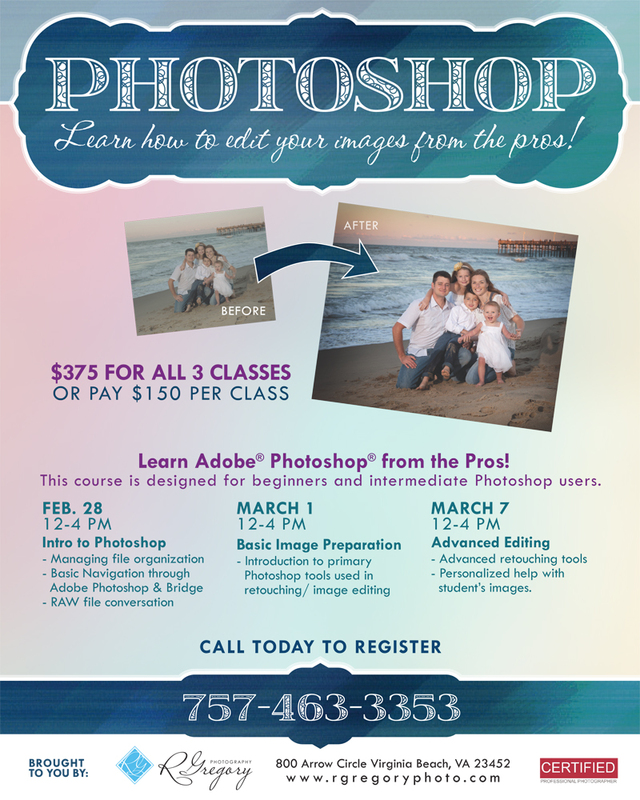 Join us for our Virginia Beach Photoshop classes and workshops, taught by a Certified Master Professional Photographer and graphic artist, at our studio in the Little Neck area of Virginia Beach. If you’re an amateur photographer or just want to have better family photos, these classes are for you. We offer an introduction to Photoshop, an intermediate course and an Advanced Photoshop editing class. Learn Advanced retouching tools and get personalized help with your images. Periodically we offer classes locally on photoshop. When we do, we release a set of dates for classes offering skills on different levels. Normally, there are three dates/classes to choose from in a set of classes, or you can take all three at a discounted price! The cost is $150 per class, or $375 for all three classes. The first class is an introduction, the second class gets you into image editing and the third class teaches more advanced photoshop editing features. All classes are from 12-4 p.m. and they are in the Little Neck area of Virginia Beach.